Last week at FrOSCon I received my new Linux computer with GSM chip, the Neo Freerunner . The device comes with all kinds of goodies, such as GSM, GPS, Wifi, Bluetooth, motion sensors and a micro SD slot. The hardware works just fine, but there are some software issues that make the phone not yet usable for my daily use. Improvements for that are on the way though. You might be wondering, why the <beep> is this on Planet-PHP as well. As I mentioned, the Freerunner is basically a Linux computer - which means total freedom of what you install on it. Traditionally it comes with perl and python, including GTK bindings. However, no PHP is found on it. I set out to change that. Unfortunately there were some issues with cross compiling, so I decided to compile PHP * on* the phone. There were some issues with this. From the finished compile, I copied head, expr, env and cut to the /usr/bin directory on the OpenMoko. With this done, I could compile PHP and install it to make the headers available for PHP's shared extensions. After the PHP compile was done, I set out to continue with php-gtk . For this I had to install a few more packages: libglade-dev, libglib-dev and m4. Of both compiles I made packages that you can just install on the OpenMoko: php and php-gtk . 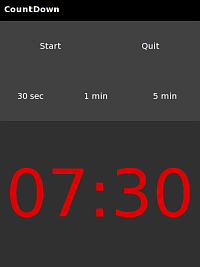 In order to demonstrate that it actually works, I've also a demo application "CountDown" available as package . fantastic Derick! i think php is an interesting language for phone apps too, there's lot of people who knows it and it can translate in a big amount of apps for the free linux on mobile hardware. thanks for sharing this! Interesting approach to port software on the freerunner itself. How much diskspace do you need for the coreutils and PHP itself? And more interestingly, how long did it take you to compile PHP on the freerunner? The four binaries from coreutils are just 230kb unstripped, but the big disk space user is the compiler, gcc. The GCC package is about 250Kb and you might need to install additional dependencies too. Compiling PHP took about an hour I think. I'd have cross compiled it - but there were some issues with libtool when cross compiling php-gtk. I already wrote a Wifi-app and some more based on your packages. Is it possible to make you write how to compile the different PHP-modules (such as MySQL, PDO, SQLite, etc...)? Or even get you to compile and package them (which would be awesome and make me willing to donate a minor fee)? Did you finally build php-gtk2 for the Neo Freerunner compiled with pdo and sqlite extension? Can you post some script or download link?